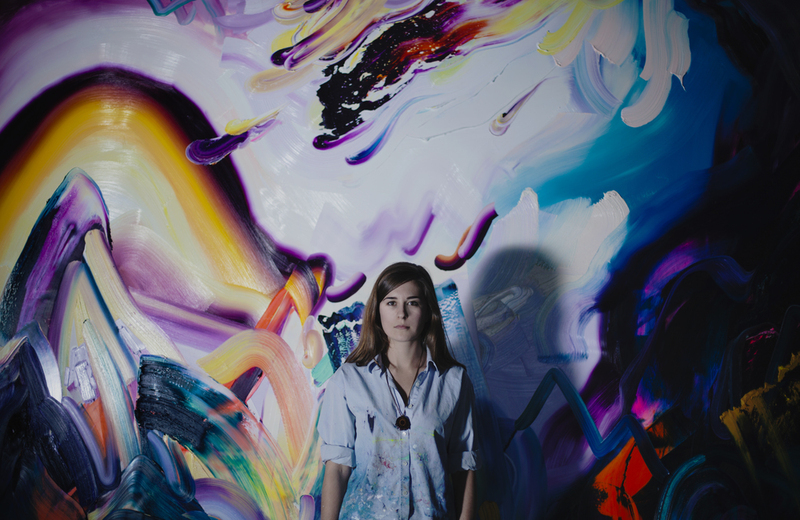 Last week, talented photographer Sandy Pranjić and I had the pleasure of invading the studio of Erin Loree, Toronto-based figurative abstract artist and all around maker, shaker and rule breaker. Her visceral paintings have the ability to not only stop you in your tracks, but to lure you into a intuitive investigation of medium, colour and emotion. 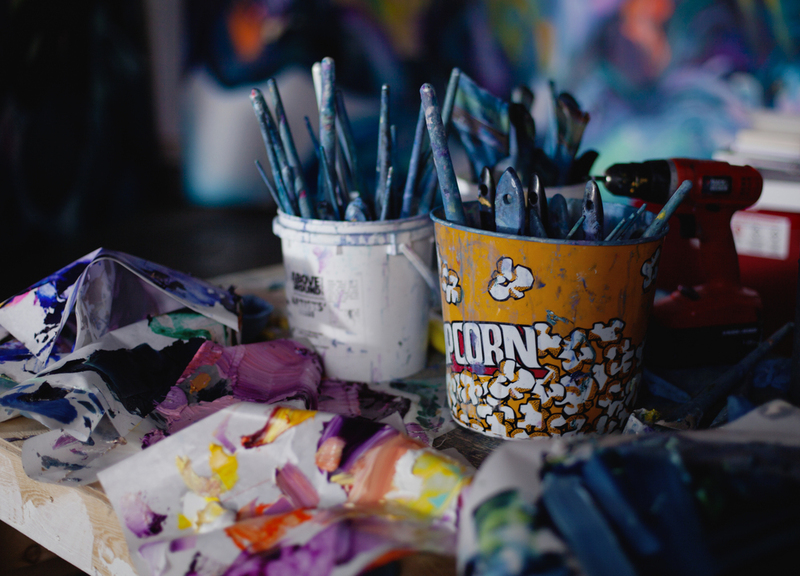 We sat down over tea and had a stirring conversation about the psychological game of painting: from abstraction, to trusting your subconscious and never staying stagnant. What’s your first memory related to artmaking? I used to draw every day with my dad, for hours. On the floor, filling piece of bristol board after piece of bristol board… My dad is an amazing draftsperson and he would draw these dinosaurs and animals and cartoon characters, breaking them down into geometric shapes so I could draw them too. We did that for years and years. He would always encourage that creative side of me. So from a young age, you had learnt how breaking something down helps you approach it with less fear of making a mistake. When you have a foundation, you can take it in whatever direction you want. My dad also has a hilarious sense of humour, so he would put his own cynical twist and reinvent the characters in his own way... and that helped me to feel confident creating on my own. How do you find that balance between taking your practice seriously and not taking it too seriously? How has your process developed in the past couple of years? What I do now is completely different than what I used to do. I used to paint realistic figurative work and I felt comfortable in my ability to execute the human figure and confident when people recognized and appreciated the skill I had. At one point, I started to layer figural elements onto acrylic washes with thin oil paint but I found that planning the work, getting a model, taking photographs... it just took a lot of energy that wasn’t really well spent. I needed a more raw, immediate form of expression, so I stopped using references. I was still painting the figure, but from my mind. This was so liberating because from that point on, the work became about the process and being totally present in its creation. Not having a plan forced me to welcome mistakes without judgement, and just trust what I was doing. My process now starts and ends on the canvas. I don’t plan anything beforehand. Embracing that pure intention must be nerve-wracking. It’s interesting because if you have formal training, you have this understanding of how to use the material in a conventional way, and you know how to create a ‘successful composition’. That knowledge is internalized but you want to forget it about it constantly so that there's room for discovery in the process. Do you think you could have created this work if you didn’t have a formal background? Do you find yourself that going back to previously painted forms and ideas makes you observe or understand them in a different light? That happens to me all the time, and honestly I hope it happens with every painting I do. Sometimes you understand your piece after its completion, sometimes it’s a month and sometimes it takes years to get it… Which is why it’s important for me to always be painting. If I stop for a period of time, that understanding will get lost somewhere and it won’t come out inherently. What I learn from each piece needs to be applied right away to the next piece. There can’t be too much space in between. Do you feel under pressure when creating a series of works in this case? It’s actually been a bit of a struggle because I don’t work strictly in series. Each work leads to the next and if I have a show, the work that I make during that time frame is what goes into it. Of course, there are certain themes I can identify in a body of work which are a deeper investigation of something and those dots can be connected after… but when you’re creating the work it’s difficult to see those threads. If you have a lot going on, you don’t necessarily get enough time to sit with the work once it’s finished, and I find that really important to be able to extract meaning. As a creator of abstract pieces, do you find it challenging to present your work in a clear and cohesive way? Do you work on various pieces at the same time? I usually do them all in one shot. They have a certain energy to them that I normally can’t replicate if I go back into it later. It’s often extremely uncomfortable to go back because I’m not in the same state of mind and don’t have the same motivation for making it. It’s been a huge learning curve to work on the large canvases because I’m challenging myself to unify them in some way. I've been leaving them partially unfinished so that I can tie them together in the end. I don’t want them to feel like they have separate parts. The composition should be seamless. How long does it usually take you to complete a painting? It varies. Since I paint the majority of each piece in one sitting, it could take an hour (for a small piece) or days. But the best paintings are the ones I don’t care about in the beginning, in which anything goes and I don’t care if I ruin them. It’s a psychological game you have to play with yourself all the time. I'm sure many artists would say that the more precious a piece is, the less likely it is to work out.The most successful paintings for me are the ones that happen the fastest, with the least hesitation. It's all about risk-taking, and it’s the conviction in the strokes that I really have to think about. You always know at a certain point whether a painting is going to work out or not. It must be heartbreaking to reach that point. Spontaneity is all about being able to listen to your gut. This was a crazy year. I took a lot of risks, made a lot of big decisions - like getting the studio - but honestly, it never feels like a risk if it feels right. You’ll always find a way to make it work and you have to put yourself outside of your comfort zone. You can’t stay stagnant. Do you find that our generation has lost that sense of self reflection in the face of individualism? I feel like sometimes the bigger picture isn’t valued enough. I went to do an artist residency in Peru and that was the very first time that I ever experienced communal living, creating… it was surprisingly uncomfortable for me at first and it took me a long time to break out of my shell because I had always taken pride in my independence. We’re not taught or encouraged to relate to people in that creative way. I mean, love spreads and infuses you with life in a way that nothing else can. As soon as you feel these sparks when you’re working or creating with other artists, it’s undeniably powerful. What role has travel played in your practice? Travelling also breaks the boundaries of language. Definitely. When you learn a language, you see how we consciously and subconsciously absorb and internalize information. You become a child again. Everything is fresh and immediate. That’s why I hope my work will evoke some visceral response. I want it to capture people’s attention, draw the viewer in but also have this eternal unfolding that the closer you get, the more details you can investigate. It’s hard to give advice because everyone has their own journey to follow within their own time frame, but I would say this: I would urge them to get in touch with their deepest beliefs because what you believe in life determines whether or not you’ll take the steps towards what you really desire. If you don’t believe something is possible, you might have this dream but the only thing that’s going to allow it to come to fruition or unfold is if you truly believe it’s something that you’re capable of doing. It’s this delusion you need to have in order to really manifest your dreams. Trust your heart. You can follow Erin Loree's work on her website and Instagram. Stay tuned for her upcoming solo exhibition at Angell Gallery on January 8th!